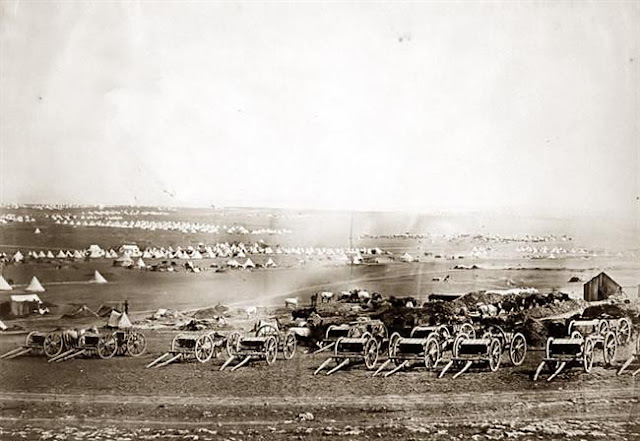 View of the plateau of Sevastopol (Crimea), with artillery waggons in the foreground, and tents on the plains in the background, during the siege of Sevastopol. Photo by Roger Fenton, 1855. 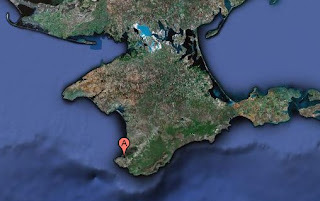 The central theme running through the Crimean War was the appalling siege of Sevastopol, a foretaste of the trench fighting of the American Civil War, ten years later, and finally the First World War. Soldiers manned the trenches night after night through two harsh winters, in the first with almost no winter equipment. Sorties led to hand to hand fighting along the entrenchments. The Russians developed the art of sniping from the “rifle pits” dug in no man’s land. The predominant experts were the engineers and the artillerymen; the flamboyant actions of the cavalry a world away. Fenton disembarked in the port of Balaklava and reached Sevastopol in March 1855. Fenton left before the fall of Sevastopol, which transpired on 8 September 1855, when it fell into the hands of the French led by MacMahon.